Deborah Allen is a storyteller who has the gift of music. Her songs have been to the top of the charts time and time again, but it’s her passion for life and helping others that is most infectious. With a new album, a new mentoring project, and a new charitable foundation called The Art of Dreaming, she has a lot to talk about. How old were you when you knew you wanted to make a career with music? The best way to answer this question is to tell the story of my mother and me. When she was pregnant with me she started noticing a slight glitch in her voice every now and then. She knew something was wrong but didn’t say anything about it to anyone. It was just occasional, but enough to make her aware. The day I was born, my mother had a spiritual revelation that her prayer had been answered when, as she was holding me in her arms, she saw my name appear above my head in the shape—and in all the colors—of the rainbow. Then, she says, there were little lights flickering from each letter…D E B O R A H. “You know, like out in Las Vegas,” she always adds when she tells the story. The nurse took me back to the nursery, and then she came back and asked Mother what she was going to name her baby girl. “Oh…D E B R A,” the nurse said. “No…it was D E B O R A H,” Mother told her, referring to her vision from God. The words it was being the only subtle proof that she had had the spiritual revelation in her hospital room earlier that day. She later said her heart started pounding. She felt it was another affirmation that her prayer had been answered. My mother was not a stage mother. What is so amazing about her is how she listened to me as a person and not just a little child with a foolish dream. She gave me immediate validation and encouragement. I love her so much for that. So, I would say, I was born to sing. When that went from a childhood dream to a career and a dream come true, I can’t really say. All I know is there have been many opportunities to quit, but I never would and never will. That would be like a slap in the face to God, who so generously answered my mother’s prayer for a healthy baby—with a strong voice. By the way, after years of many doctor visits, my mother finally discovered that her vocal problem is called Spasmodic Dysphonia. (She kind of sounds like Katharine Hepburn in On Golden Pond.) She goes once every three or four months to a doctor in Memphis for Botox injections directly into her vocal chords. It really seems to help. My mother is an amazing person. How did you get your start in the music business? When I was growing up in Memphis, I participated in a few local talent contests and pageants—anywhere to be seen. I was honored to be a WHBQ-tie on world renowned DJ George Klein’s weekly Saturday television show. (Not as a singer but as a spokesperson and dancer.) That was my first introduction to the public through television, so I would say he was the first professional to “discover” me. But one of my first starts came in Nashville at a chance meeting with Roy Orbison and Joe Melson at the IHOP. It was so funny. I felt comfortable at the IHOP, because I had worked there for a little while as a waitress. I knew the cook and all the waitresses, so I felt okay to dine alone there. There I was in my funky little red dress and dark red fingernails eating breakfast when I saw this man with jet-black hair and black sunglasses sitting across from this salt-and-pepper haired gentleman. They were so sweet to listen and let me go on about it. They were very encouraging and told me to keep in touch. At the time, I didn’t have a phone, and I was saving my money to join AFTRA. Finally, when I had enough, I went down to join. It was very shortly afterwards I did meet with Joe over at what was then called DBM Studios. He asked me to sing background on two Roy Orbison tracks. I wish I could tell you what the songs were, but I really can’t remember. I was just so happy to be there singing. I do remember it was going to be on some sort of K-tel type collection. I believe I was paid somewhere around $87. That was my first paying job as a singer! What a great place to start! Another milestone early on for me was my duets with Jim Reeves. Those were the very first recordings to use the overdub process in a way that allowed someone who was very much alive, like me, to record with a deceased superstar, like Jim Reeves. My favorite recording out of the five songs was When Two Worlds Collide because, as I stood there in the dark at Woodland Studios listening to the silky smooth voice of Jim Reeves coming through my headphones, singing with him “that’s what happens when two worlds collide,” I could truly feel his presence in the room. He was there. And, through the magic of modern day technology, our two worlds truly were colliding. World-renowned children’s book author, playwright, cartoonist, and songwriter Shel Silverstein provided another instant life change for me. He came to hear me sing at the Hall Of Fame lounge. After my set was over I sat with him and asked for his feedback. I had no idea where he was going with the conversation but, in the end, every comment he made pointed toward songwriting as the key to finding my own uniqueness, and having a creative outlet, while I tried to build a career. This was all beginning to make sense to me. Well, the first part of that statement is true, but I’m not so sure about the last part. Anyway, I told him I’d give it a try but that I wanted him to listen and be honest with me. Thanks to Shel sharing his generous wealth of wisdom and encouragement, my life was changed in an instant. Suddenly, right then and there, I became a songwriter! You have been blessed with two careers—one as a Grammy-nominated recording artist and another as a songwriter. Which has been more fulfilling? 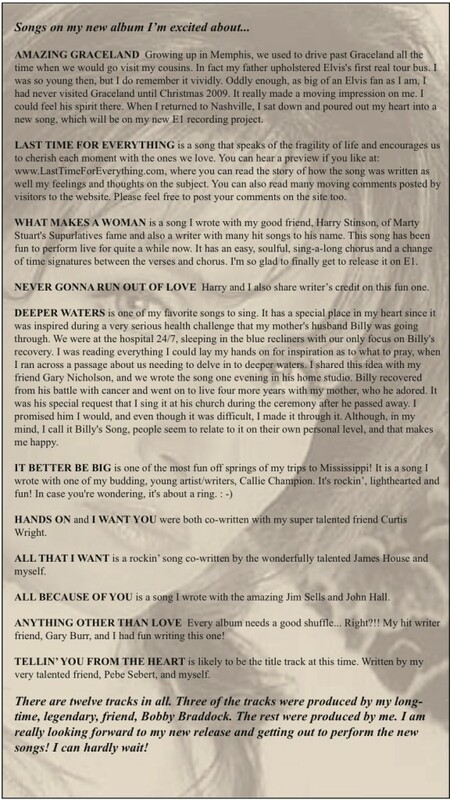 Singing definitely came first but after Shel inspired me to begin writing songs I loved the creative process. Really my love for singing—expressing feelings and connecting with people through performance—fuels my passion for writing. I love to write songs that make me want to sing. Also, after live performances, it is such a great feeling when I hear comments on particular songs in my show. But after I began enjoying the huge honor of having other artists record my songs, I realized the even deeper, fulfilling rewards of songwriting. I couldn’t imagine one without the other. When did you write your first song? The first song I really ever wrote was the ac cappella song I sang for Shel, Four Leaf Clover, which I mentioned earlier. My first guitar was an old Washburn 1800’s ladies Parlor guitar. It’s really pretty. It has some abalone inlay around the hole. I had two four leaf clovers inlaid in abalone on the headstock to commemorate that first song. Can you give us a short list of some of the artists who have recorded your songs? 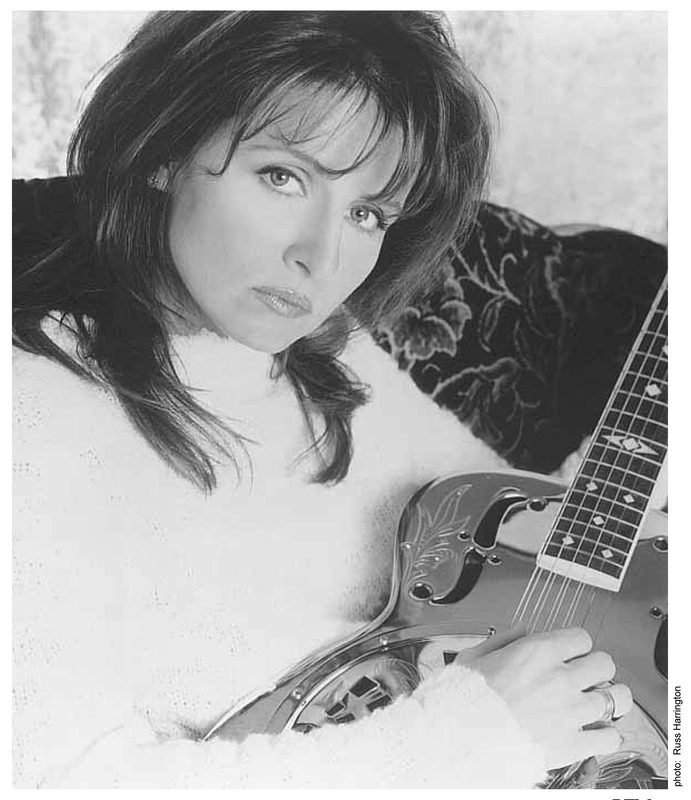 I have been fortunate to have my songs recorded by so many great country artists, such as LeAnn Rimes, Patty Loveless, Brooks and Dunn, Janie Fricke, Tanya Tucker, John Conlee, Brenda Lee, George Jones, Conway Twitty, Loretta Lynn, Lorrie Morgan and the Nitty Gritty Dirt Band, to name a few; as well as pop artists, Diana Ross, Sheena Easton, and Fleetwood Mac. It’s a huge compliment. I have also enjoyed having songs on television and movie sound tracks, for instance, the movies Coyote Ugly, Clinton and Nadine, The River Rat and A Thing Called Love. It is a lot of fun reading the credits as they roll at the end of the show. Where do you get most of your song ideas? I get my ideas from real life, whether it is mine or whether it is inspired by others. I also have a pretty big imagination, which keeps me entertained. Has God ever provided an unexpected “detour” in your life that turned out to be positive? I am a very spontaneous, adventurous person at heart, so in a way you could say my whole life has been a detour. That’s not to say that I am not an extremely focused person who has definite ideas about what I would like to accomplish in life. It’s just that, I guess I innately know that, as big of a dreamer as I am, God has an even bigger plan for me and His imagination is much larger than mine. Therefore, I like to keep myself open to the many unique life experiences that unfold. I like to explore the possibilities. I know that every seeming sidetrack in my life has enriched me, making me better and more. When I was in high school back in Memphis, I had a boyfriend who I and everyone else was sure I would wind up spending my whole life with. Unfortunately, or fortunately for me, he had a roaming eye, and I don’t think that’s all that roamed : -) But it was just enough for me to break the ties and move on. I rebounded into a relationship that, after a very short period of dating, wound up in marriage. I had no business getting married, but he seemed to be crazy about me. Still recovering from a disappointed heart, I remember thinking, “Oh well, at least one person can be happy.” And besides that, he was a drummer and I could sing in the band. Funny how we simplify our choices when we are determined to move on. Well, turns out he was a drummer who used to practice on me. Needless to say, that marriage did not last long at all…about a year and a half. But what it did do, after many nights of playing hotels and clubs in the southeast, was bring me to Nashville. Because of my love for great jazz singers, I kind of had visions of moving to Berkley or New York, but he wanted to move to Nashville. He had it all figured out. (As if that’s possible.) He said he could be a session player, and I could be a country singer. So, you see, there was a detour. It seemed like a bad choice for me, but it got me to Nashville…right where I was supposed to be! There has been a lifetime of detours since then—personally, musically and otherwise. It has been a wild and wonderful ride so far. A couple of years ago, through an unlikely chain of events, I wound up judging a talent contest here in Nashville. A couple of weeks later, one of the contestants reached out to me through e-mail searching for songs. I was happy to share some of my songs. Later we wound up in the studio, with me producing. Through that friendship a gate was opened to a whole new world of young, talented friends in Mississippi. Since then, I have been spending one week out of each month for over a year and a half helping to nurture and cultivate individually the natural talents of each one of my young compadres. There are a lot of show choirs down there. A lot of pageants and talent contests too. So at first they were all interested mostly in performance and singing. I learned so much about myself as I began sharing everything I knew and could possibly think of to help them. Over the past year and a half, over one hundred and seventy five songs have come into being, all co-writes between me and my young artist friends. Almost without exception, writing was a brand new adventure and territory for them. But now they are all developing into some great thinkers and musicians, carving their own unique direction for their careers. It has been a lot of work and very emotionally draining. I never learned to give less than 100% of myself, and I don’t think I ever want to. It has also been very physically taxing at times because of the drive alone. But seeing the growth in all of these young artist/writers has been amazing! I am positive there are a few who we will be hearing from on a national basis as their career paths unfold. For me, the greatest gift of all has been the enduring love and friendships I have found by merely being willing to trust and stay open to life’s mysteries and many unexpected detours. You have worked with an incredible list of people—from Roy Orbison to Shel Silverstein—and now with the new songwriters at your One On One events. What’s going on with you personally? I am super excited about this era of my life right now! As a result of my One On One mentoring program, we are working on developing a charitable foundation called The Art of Dreaming, which is intended to help underprivileged children reach their dreams through music. It is in the formulation stages, but it is my hope that we will be able to help through scholarships and other meaningful opportunities. I have also just produced a new album on a beautiful, talented young artist from Yazoo City, Mississippi. Her name is Margaret Phillips. I am really proud of her and the work we have done together. I am getting very positive responses for Margaret and her music from major record labels. She co-wrote ten of the thirteen songs on her debut album. We are planning to shoot her first video in the very near future. I see great things in store for Margaret! The sky is the limit! Also, I am thrilled to announce that I will be releasing a brand new album I am recording for E1 Music! E1 is a record label distributed by Koch. They are the largest independent distributor in the world. So I feel we have an incredible opportunity to reach a great audience with my new music. There is even a possibility of a television show for me as well! This website is about both writing and music. What kind of books do you like to read? I like to read biographies. There is nothing more exciting, interesting or entertaining to me than real life. I also love to read anything positive, uplifting and enlightening. The Daily Word has been part of my life for a long time. My mother introduced me to it early on in life. It is a daily devotional that helps to start your day off in a positive manner. What kind of music do you listen to when you’re relaxing? To completely relax I guess I have to listen to spacey, new age music with the sound of nature, you know, the kind you listen to when you are getting a message. Otherwise, I start listening to all the parts the musicians are playing, the riffs and expressions of the vocalist and all the lyrics. Now, if you ask me what do I just plain like to listen to, that’s another story. That list could go on forever. At the top of my list for all time great listening is Aretha’s Gold. I love Aretha, Ray Charles, Elvis Presley, The Rolling Stones, Chuck Berry, B.B. King, Patsy Cline, Tammy Wynette, Brenda Lee, Ella Fitzgerald, Billie Holiday, Sarah Vaughan, Nancy Wilson, INXS, U2, Bonnie Raitt, Linda Ronstadt. There are so many greats! That’s what gets me and reels me in. It’s not how many notes you can sing…it’s how much of the heart and soul is in it. If you were a song, what kind of song would you be? If I were a song, I’d be a song that started out with a soulful, out of tempo, deep emotional intro that kicked into a positive up-tempo rocker…a love song for sure! Yep…a love song. Do you have pets? If so, please tell us about them. I love animals so much. They talk with their eyes. I had a horse named Pepper. He had so much personality. He was an American saddle horse, but we found out he liked to run fast. So, after we got through prancing around, looking pretty with heads held high, we were barrel racin’, pole bendin’ fools!!! Pepper loved to open the barn gate with his nose and set his other friends free. He was quite the prankster! His favorite drink was Nehi grape and orange! Then there was Hooper the Super Dog! He was a black and white, longhaired, mixed breed, but mostly Border Collie. He loved to catch and retrieve anything. If he got bored, he would take a ball to the top of the stairs, toss it down and then run down to catch it. He would do this till he was exhausted. His big trick was…I would say, “Hooper, would you rather be married or would you rather be dead?” Hooper would flop down on his side and play dead right on cue! I had a big sheepdog named Harley. I loved Harley! We used to go walking up in Deerfield (a neighborhood near me that has a lot of open space for the deer) on a warm starry night. I would lay down in the grass. Harley would lay down on his side and let me lay my head on his chest like a big pillow, as I stared up into the clear night sky absorbing the wonder of it all. Instinctive, as a sheep dog, he used to think he was personally responsible for herding the cars as they passed by our house. We loved Harley so much. He loved us and watched over us all the time. He lived to be fourteen. Before he left us, we got a cat. Harley loved him. Gosh, I could write a book about Romeo, our solid white cat. The most interesting thing about Romeo is that several times a day he jumps up on the commode and uses the bathroom like a human. He even scrolls the paper into the toilet. Unfortunately, has never learned to flush. Romeo also loves to jump up into the grand piano as I play. He likes the vibration. When he was a kitten, he used to try to catch the hammers as I would play. I have been very blessed to have great animal friends throughout my life. 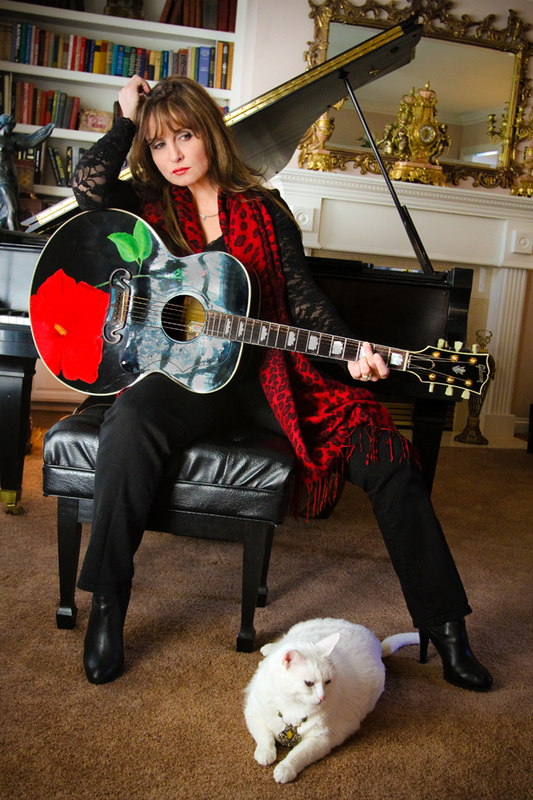 For more information about Deborah Allen, her music, and her One On One sessions, visit her website at www.deborahallen.com/. To hear a cut from her upcoming album, logon to http://www.lasttimeforeverything.com/. For more Deborah Allen music logon to http://www.myspace.com/deborahallen. So proud of you! You are truly a “Super Star” in our hearts. Hope to see you before too long! God bless. Loved the interview… God bless. Elvis was the best performer that ever lived. I love to hear all his songs.